Part II: Stay With The Factory System Schools Of The 20th C. And Be Out Of A Job. It may be that nothing has changed in the way you teach, but schools, teachers, and methodologies designed and operated on past assumptions will not survive. Doing the same things that seem correct because they are familiar and you have mastered them, will put you out on the street. Teachers doing what worked in the past will change or be by-passed. In the public schools that are evolving and necessary for the Information Age and the Interactive Age; America’s future, only educators who understand the requirements of our times will survive. We can no longer accept teachers who “teach” using the old model of top-down, coercive instruction. The old, “Sit there. Listen to me! Keep your book open and your mouth shut,” model worked for training factory workers and teaching workers to obey authority. Now, educators must evolve teaching into interactive, multimodal experiences utilizing virtual space resources where learning requires the student’s full attention as they fight pirates, explore the Philippines, solve math problems that that let them enter a world of applications, walk on the surface of each planet in our solar system, follows the magic and mystery of an educational game designed to teach the basics of physics, urban design, power grids and city planning, move through the human body to understand how it works, and walk inside a leaf as a botanist. In none of these intensive learning experiences is the teacher the sole source of information, or the policeman in charge of student adaptation to school. The role of the teacher must change and it will never be the same again. If you fail to understand what is happening and necessary, you will be of no value to students. 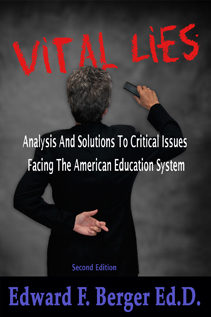 Excerpts taken from: Vital Lies: The Irrelevance Of Our Schools In The Information Age. Written as a format for national discussion. Let Parents Decide: District or Charter? Grateful to have found you via Tom Whitby’s space at My Island View. I am just beginning to explore your work and eager to read ‘Vital Lies’. I once had a dream of becoming a Montessori teacher because I believe in the ideals and tenants that are rooted in Dr. Montessori’s educational philosophy: children are natural learners. Teachers are to prepare the environment and be supportive, yet stay out of the way. I was very close to completing my training but became disillusioned, incredibly disappointed, and chose to not continue to completion. I was fulfilling my practicum requirement in an ‘authentic’ Montessori school that I quickly discovered was far from what I had observed over my ten years as a Montessori trained classroom volunteer and in my studies. Moreover, I was exhausted in my fight for wanting to include technology in the environment. I did not want to replace any Montessori materials, of course, but augment them. Had Dr. Montessori been alive today, how enthusiastic she would have been to see the tools we have to enable children to satisfy their natural desire to learn! Would she have not allowed a typewriter or a pencil in the learning environment? Yes, she would have. Additionally, she would have created a work to allow children to explore how to “make” a typewriter. She would have created a movable alphabet in the language of computer programming. It’s not that we need to evolve into something new as educators, but revisit what is already in existence while incorporating the new tools that have become available through the development of technology. In short, I think we share some of the same ideas, and again, I am looking forward to reading ‘Vital Lies’. Kimberly, great to connect with you. I too have had the Montessori – modified Montessori – Montessori mixed with Waldorf – and other confusing experiences. If Maria was with us today, she would adjust to kids who are not limited by lack of stimulus. Her insights and the materials developed, should be modified, but the basic principles should not be ignored. Learning is natural and does not need to be force-fed and measured by meaningless tests. In our public and in most privatized schools, our system of Factory Age education does not meet kids’needs, or the needs of 21st C. learners. We can change that. I understand the frustration of failed change agents who have come to believe that the whole educational system must be destroyed and re-build by corporate and other forces that do not have to protect teachers or children. I fear these failed change agents are winning because educators have not entered into a national dialogue about change and reshaping our schools. Rhee, Klein, and other’s who have failed because they never bothered to identify the problems before trying to force their solutions, and who have opened the door to corporate greed and access by profiteers to the education tax dollars we pay, have become America’s worst enemy. There are educational leaders I believe in. Diane Ravitch is at the top of my list. I am impressed by Tom Whitby and his ability to focus educational issues through Tweets and his Island View. I follow a great lady, Dr. Sarah de Freitas in the UK. Her work with virtual resources, games, and the application of these technological opportunities to business and education are like science fiction coming true and a special magic available today, if education can evolve. (I mean when education evolves). Let me know what you think of Vital Lies.